June 1, 2019- 7:00 am- BRAWS 3rd Annual Fun Run- Vienna Community Center- Mark your calendars! We are pleased to announce that in addition to Distribution Day events, we need help with Monthly deliveries to our sponsor shelters. Time preference is up to volunteers and there is some flexibility with delivery dates. Please sign up HERE if interested. Check back often- we are always adding new shelters! 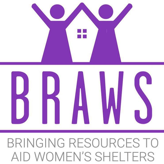 To RSVP for Distribution events, please go to our SIGN UP PAGE or email Jaime at distribution@BRAWS.org - Thanks! The Fun Run will be held on Saturday, June 1st at the Vienna Community Center- 120 Cherry Street SE, Vienna, VA. 22180 thanks to the generosity of the Optimist Club of Greater Vienna. Registration starts at 7am. Money raised will be used to purchase new sports bras and underwear as well as menstrual supplies for our community in 2019! Please register HERE. Donations of new w/ tags sports bras and underwear as well as unopened packages of pads are greatly appreciated. ​Want to be a Sponsor? Click HERE! our 5th Annual Mardi Bras was a Huge Success! Mardi Bras is BRAWS largest fundraiser of the year - bringing in the funds to support over half of our annual budget! Money raised from this year's Mardi Bras will be used to purchase menstrual supplies and undergarments for shelters and schools in our community in 2019! Huge thanks to our amazing Sponsors- their support is crucial to our mission- check out our Sponsor list- these are area businesses who care about the women and girls in our community! We have a new Facebook site just for Volunteer Opportunities! Go to Facebook & search BRAWS Volunteers or click HERE then send us a request to join! Get all the latest info on Distribution Days & other Volunteer Opportunities.